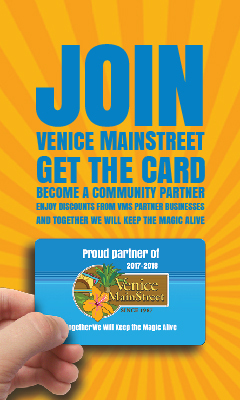 Venice MainStreet and Venice Blue’s Festival donated $3,000 to the Venice High School Band. Venice MainStreet President, Tracy Ivey, presents a check to Jonathan Case, Venice High School Band Teacher. The donation of $3,000 was for the participation of Venice High School students in the 2013 and 2014 Venice Blue’s Festival.